Tell Me on a Sunday: Who to you go with to the theatre? Sorry, I got Barbara stuck in my head there for a moment. Right, so you may have noticed that I have not had a chance to write a whole lot lately, yeah, sorry about that. It’s not that I didn’t want to write; I just literally had no free time in which to write. Hopefully the crazy that has kept me spinning will slow so I can get get in some blog time! 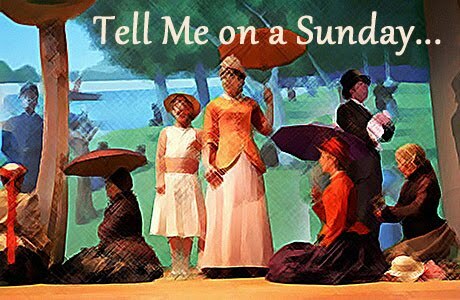 All righty then, enough with the chitchat here is todays Tell me on a Sunday question: With whom do you like to attend theatre? Is there a specific person? Why or why not? I love to attend theatre with all of my friends, because they always notice something that I don’t, they interpret something differently than I do and are super interesting to do the post show chat with. (Also all of my friends are super interesting, hence their super interesting commentary) Not all of my friends are theatre people, and that’s fine with me. I don’t need you to know anything or everything about theatre to go with me; you just have to want to go (I’m easy like that). But the person that always gets first pick of show tickets, whether she wants them or not, is my Mom. I love going to the theatre with my Mom. The things she notices and the way she comments on them always interest me. She likes theatre, but she didn’t study it. When I got into theatre she helped with song choices, rehearsals and even getting my hair dyed black (Thanks King and I). After every show we break down everything we just saw, from the performances to the sets, costumes and plot. We debate whether things that stuck with us are directing choices, acting choices or were specified in the script. We try to imagine how hard it must be to wear that ridiculous outfit or dance in those heels. Sometimes I love something that she couldn’t stand, sometimes we both gush but each over a different aspect of the show. Sometimes we go back at the end of a run to see how something has changed and debate all over again. Yes, it is possible that I think my Mom is a theatre whiz because we find the same things funny, the same things annoying and both love a happy musical…but more than that I love having this to share with her, especially since she’s the one that helped make me into this theatre crazed person I am today. I guess it’s up to you if that something we should thank her for or not. Happy Mother’s Day to the bestest theatre Mom I know. So whom do you like to go with to the theatre? Why do you like going with them? I look forward to reading your responses! Next Post How’s that first date going?